After an extremely long run of GPUs manufactured on 28 nm process, we are finally seeing 16 nm designs from AMD and Nvidia. 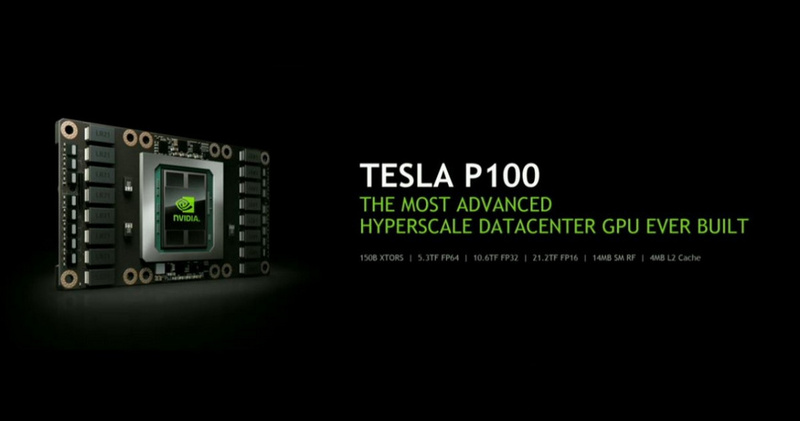 Nvidia’s first card using 16 nm transistors and Pascal architecture is Tesla P100. Unlike consumer GeForce cards, Tesla cards are aimed purely at high performance computation, rather than graphics. However, the GPUs inside have so far been very similar to the ones running our games. The main difference on GPU side was the lack of FP64 performance in GeForce cards (except Titans). The cards themselves differ in terms of ECC memory, cooling and connectors, thus Tesla P100 looks very different from cards running our games. The new chip, named GP100 looks quite impressive. Nvidia has started their 16 nm GPU line-up in big way. GP100 is the largest GPU ever at 610 mm2, beating even the late 28 nm GM200 (601 mm2). It is made of 15.3 billion transistors, but only 56 of 60 SMs are enabled, likely due to yield issues. The card runs at 1328 MHz base clock with 1480 MHz boost. Considering that these are the conservative clocks for the extremely reliable 24/7 performance, we might expect higher clocks on consumer Pascal GPUs. P100 offers 10.6 TFLOPS FP32 performance, significant increase over GM200 based Tesla M40 (6.8 TFLOPS) and Titan X (6.1 TFLOPS). While the difference is very dramatic, GM200 achieved its FP32 performance by severely reducing FP64 compute performance. On the memory side, P100 has 16 GB of HBM2 VRAM, offering 720 GB/s bandwidth. The whole card has 300 W TDP. As Nvidia is currently selling their most powerful GPU for high performance computing, it is very likely that we will have to wait for a long time before it appears in GeForce cards. As with Kepler and Maxwell, we are likely to see smaller Pascal GPUs aimed for gamers first. There is also a chance, that first Pascal GeForce cards will use GDDR5, rather than HBM2. Either way, the further improvements in single GPU performance will appear.